Some of the best grassroots fundraising for projects in developing countries take the form of clothing donation campaigns. Last summer, as part of a campaign I did to support the Cambodian bloggers summit, I got many donations of technology t-shirts. So many generous people donated, that I had enough to distribute some t-shirts to the kids at Roteang Orphanage, managed by the Sharing Foundation, including a foo-camp t-shirt donated by Tara Hunt for Pharoth. More recently, The Sharing Foundation recently ran a successful pajama drive and has over 300 pairs of new pjs for the children at Roteang Orphanage. 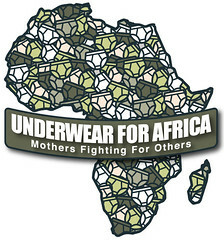 Mothers for Africa is running an underwear donation drive. According to a post on Mothers Fighting for Others blog, undignified underwear the only choice for Kenya’s poor. The sale of used underwear is banned in Kenya, because, the government says, the garments are unhygienic and harmful to its wearers. But it has been unsuccessful in fully weeding them out, as they manage to find their way to second-hand markets. And without offering an alternative to the cheap pieces, vendors sell them anyway and people continue to purchase them. And, while I'm on the topic of creative ways to support projects in the Africa. charity: water is a non-profit bringing safe, clean drinking water to people in developing nations, has launched a September Birthday campaign. (Hat tip Brett Meyer at NTEN) They are asking everyone born in September to give up birthday presents and ask their friends and family for donations to build water weels in Ehtiopia instead. They hope to raise $1.5 million and build 333 wells in Ethiopia. This will serve 150,000 people with the most basic need, and greatly improve health and quality of life. More information here. I tweeted the link and some twitter followers, Paul Young and Sharon Schneider have signed up. Sharon is using it as an opportunity reclaim her September 11th birthday. My September 11th birthday has come to stand for something terrible. I want to reclaim that day and help make it represent something wonderful. My 22nd wedding anniversary is just around the corner and since there isn't a specific geek item to represent 22 years, will look at a charitable way to celebrate. Have you organized or participated in a in-kind donation drive of clothing or supplies for a developing country? Did you use social media to spread your campaign message? Have you celebrated your birthday by designating a charity? Thanks Beth! And you'll never guess what today is... MY BIRTHDAY! Thanks for the great present! I really like using Changing the Present. You can set up a registry for virtual gifts from $1 PBJs (that's one of Cooperative Feeding Items) to money for wells in Africa. Basically they have a really wide range of topics, areas of impact and $$ levels. Donors can elect to remain anonymous too. Thanks for mentioning my birthday campaign, Beth, and for turning me on to it in the first place. I'm happy to say that today, my first day, I've raised $146 for wells in Africa through the campaign. This is truly going to be the coolest birthday I've ever had. And I think anniversaries definitely "count"--whatever you want to celebrate counts because it's not about us, it's about the people in Africa who need clean water. So go for it!